When I saw this set in the new Spanish language catalog, Celebrando Creatividad, I just knew I had to have it. I loved the beautiful images especially the line art butterfly. So, this set was on my first order and I couldn't wait to get it so I could work with it. One of the prettiest butterflies I ever saw was blue with some golden flecks on it. I probably loved it so because it was so different but also because I happen to be very partial to blue. 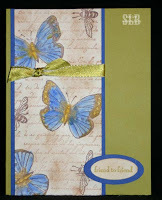 While I have some oth er more traditional things in mind for this butterfly, this is my first card with this set. It will not be my last. Flores Suaves loosely translated means Gentle Flowers and there is a very nice flower image in this set but I chose to use the background writing image, the butterfly and the bee. All products from Stampin' Up! I am having so much fun with my new sets. Honestly, I haven't been this excited about new stamps in a long time! I'm pretty much taking today to start working on lots of samples with my new sets. I should have lots of new things to show you as the week goes on. Have a super weekend everyone! Wow, love your card! I've been trying to talk myself out of this set ever since I saw it in Celebrando Creatividad too.. now I have to have it too! This card is beautiful. I have to admit I hadn't even looked at the Celebrando Creatividad until I saw your card. One more set for my wish list! !